During the summer I take way more photos of bugs than I have time to identify. As I edit them, I print one out, mark it with the date, and toss it in my “Box o’ Bugs” to get to later. Then about once a month I pick one out and do my best to identify it. And when that fails, as it inevitably does, I send up a request on BugGuide.net. 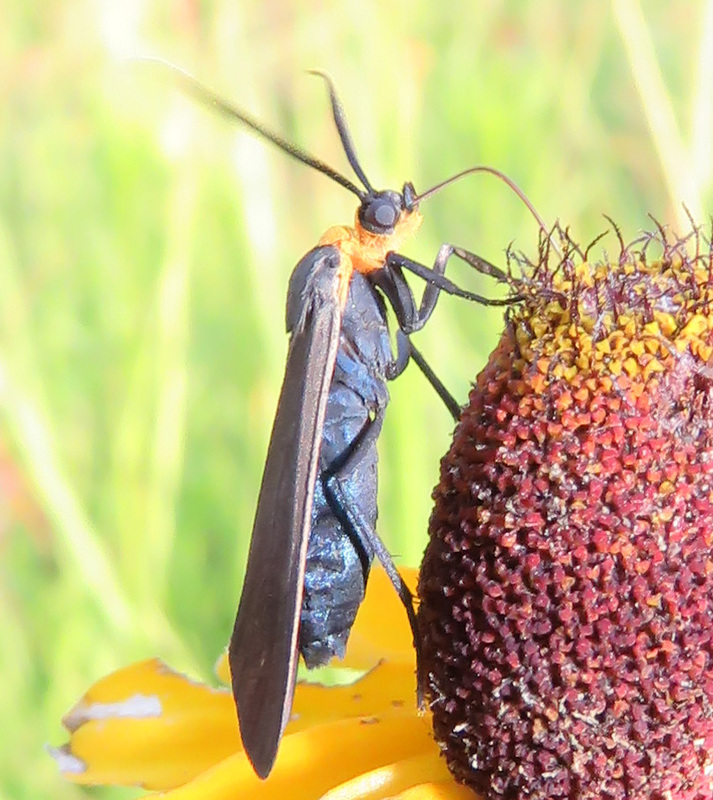 Back in July I saw this striking “wasp” on a coneflower. When I looked at my photos, I realized it wasn’t a wasp. It had long feathery antennae and a sucking proboscis, and its body looked like one long tube instead of having a narrow wasp waist. I began to think it was a moth. I paged through the National Audubon Society Field Guide to North American Insects and Spiders, and there it was! Picture number 520, the very first moth in the moth section, a Grapeleaf Skeletonizer! We have grape vines here, and that is one of the best bug names ever, so I was pretty sure I had made my ID. Just to be sure I checked BugGuide.net. Grapeleaf Skeletonizer, Harrisina americana, photo by MJ Hatfield, Creative Commons BY-ND-NC 1.0 license. 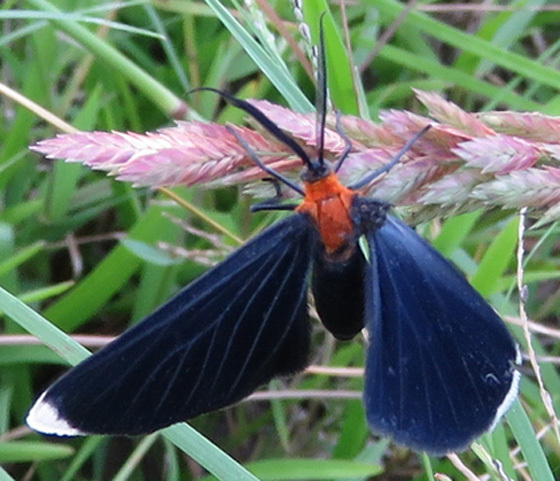 Fortunately BugGuide reported that two other moths were very similar, the Virginia Ctenucha (this name is almost as good because who can even pronounce Ctenucha? 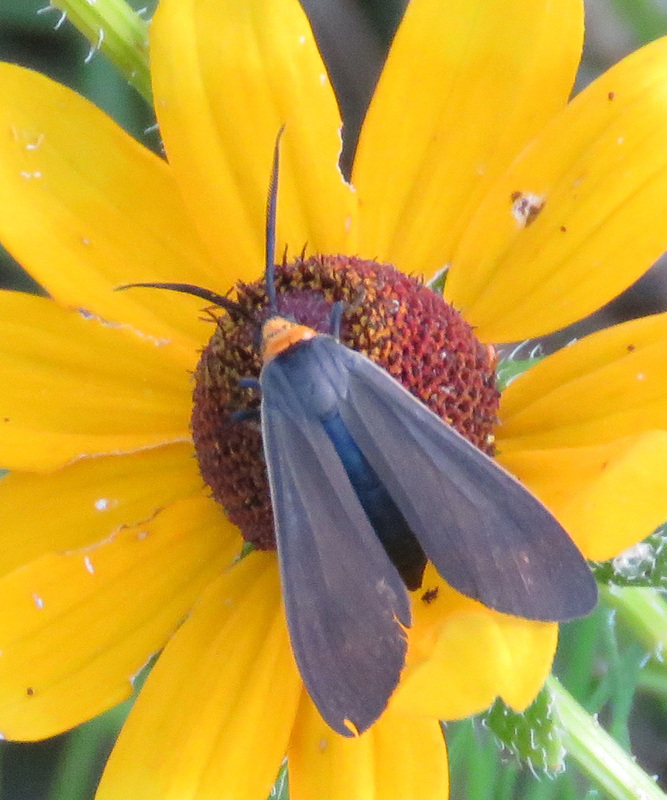 But sadly, in spite of its name, it is not found in southeast US) and the more boringly-named Yellow-collared Scape Moth, Cisseps fulvicollis. So based on range, mine had to be the latter. Reading about this moth and following links led me to a topic of wonderment that goes along with my textile interests. (And I think I sound particularly scientific in this paragraph.) 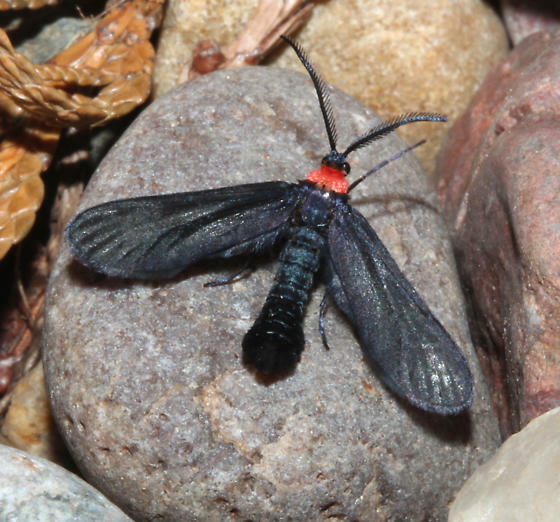 First, this moth’s coloration is thought to mimic wasps, which would deter predators. But also, it is often seen feeding on wild ageratum, Conoclinium coelestinium, (which used to be Eupatorium coelestinium). Some plants in the genera Eupatoriums and Ageratums contain pyrrolizidine alkaloids (PAs), which have been known to cause toxic reactions in humans in a few cases. 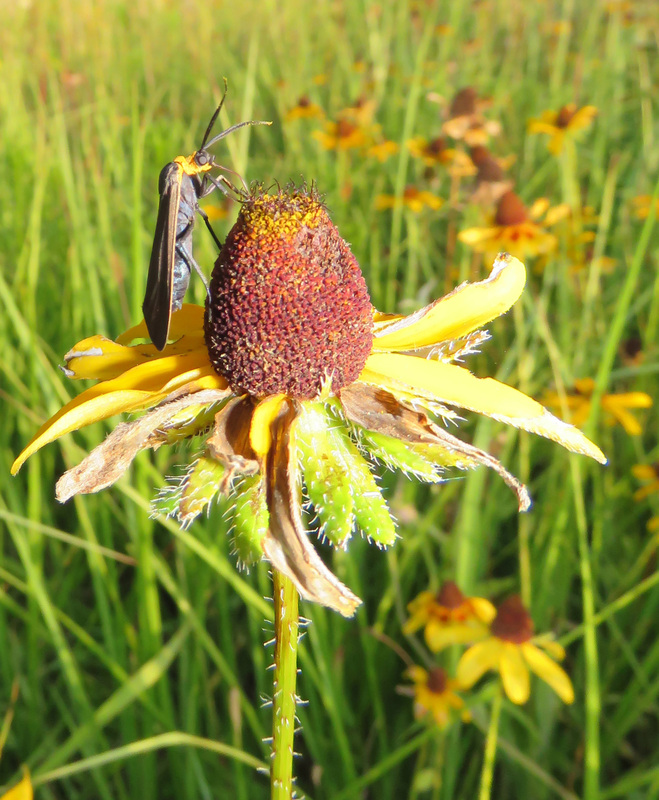 Moths that feed on these plants may be distasteful or even toxic to predators, so that and their wasp-ish appearance may give them a two-pronged defense. Going off on a tangent about the PA plants on this list, one that caught my eye is dyer’s alkanet. Hold that thought for a second while I tell you the second bit of information. Another moth, Scarlet-bodied Wasp Moth, is known to ingest toxins from my old friend the dog fennel plant, Eupatorium capillifolium, (a plant I have gotten great yellow-green dye from). The males eat the plant fluids and build up the PAs in filaments in special pouches, and then during courtship, they “discharge the filaments on the female… embellishing her with alkaloids as a result.” She may be protected from spiders as a result, and she can use the filaments to protect her eggs. (Chemical Defense paper from the National Academy of Sciences of the USA). So if two plants on the PA list are good dye plants….do you see where my mind is going now? I need to find some other plants on that list and do some dye trials. We have wild ageratum so I could give that a try. Okay, back off the tangent and back to moths and less technical language. 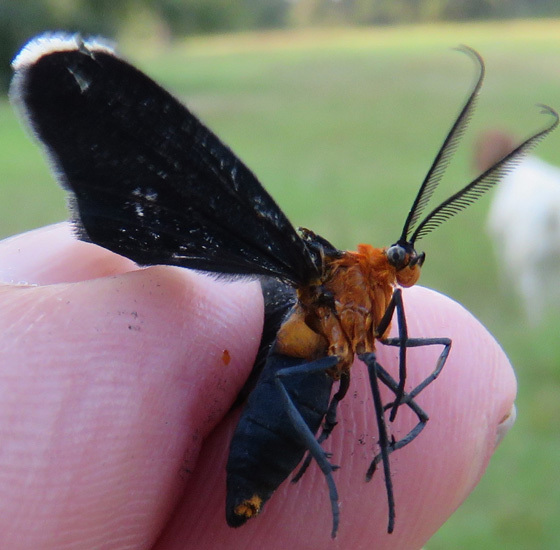 In October I came across what I thought was the same moth, but as I looked at the pictures, I noticed a much larger area of orange color on the head and body, and white wing tips. It turns out this one is called a White-tipped Black, and it is common in Texas. It is in the family Geometridae, and another common name for this family is the inchworm. So it is nice to find out what inchworms turn into when they grow up! I don’t normally pick them up but this one looked like it was on its last wings already. It is amazing to me how two creatures who look so similar are from different superfamilies. You have to go up to the order Lepidoptera to find a classification they have in common. For a very interesting look at moths, their families, their host plants, and so on, you might like the Moth Talks at the Moth Photographers Group website. Lots of pictures and easily understandable information. So this is why it takes me so long to identify insects. Not only do I spend a lot of time chasing dead ends, I also follow tangents. But doing it that way, I usually remember some of what I have learned! Nature has been around so long it has tried nearly all possible ways of doing things. As a result, the winning combinations got to move on for us to discover today. Finding those taxonomic pathways is a puzzle to be solved…if one is so inclined. You are such an inclined person. I completely understand and appreciate the efforts and the tangents. I’ve gone off on some very interesting ones myself at times. I’m always amazed at the lengths you go to identifying things. In the past i’ve done the same as you; taken a variety of pictures and then go back and try to identify the object(s). You do a great job and now i know who to go to for future identification problems!! Well, I always think, “I’ll just get the name of this little creature and that will be it,” but then I read the information posted on it and it sends me down a rabbit trail. 🙂 And then the stack of unidentified ones builds up. I swear by BugGuide – the experts there are very helpful! I’ll have to remember BugGuide next time. It does get very interesting trying to identify these bugs and before you know it, you’ve been at it for hours. Oh what fun….